This Land is Our Land: Three Scottish Landscape Photographers is a richly evocative exhibition, presenting the distinctively dramatic work of Stephen Drew, Hamish King and Neil Shaw. Halfway up the Lawnmarket, climb the steep spiral staircase to the Gladstone Gallery. It’s the perfect historic setting. This 16th century Townhouse, (owned by the National Trust of Scotland), has decorative ceiling beams and from the high windows look down on to the Royal Mile. Opposite is a narrow cobbled Close, once the haunt of James Boswell before he set off with Samuel Johnson on their epic Tour to the Hebrides. This exhibition takes you on a journey from the Borders to the Highlands through the seasons of the year. Each photograph is neatly captioned with the place name on a tiny map of Scotland to pinpoint the location. For Festival visitors, this is particularly helpful if you have no idea where Loch Morlich or Barra might be. Neil Shaw lives in Peebles, Scottish Borders and amongst his selection of landscapes, is a series of black and white prints to illustrate the local village of Eddleston during a severe winter a few years ago. I used to come here for childhood picnics, playing by the river on Eddleston moor. Here, Shaw’s images depict the same scene in a freezing whiteout. Only monochrome can do justice to reflect the purity of snow crystals, leafless trees, fences almost hidden from view in the empty stillness of farm fields, devoid of sheep. Stephen Drew only took up photography professionally two years ago and in pursuit of the art he also enjoys hill climbing “to keep fit!”. In one colour photograph, the perspective taken from the high crags of The Storr on the Isle of Skye is spectacular – a wide panoramic view of the Cuillins, sealoch, grass, rock. Another image of this mountain ridge surrounded by low lying clouds was snapped in early morning. It was a chance shot when Drew turned around to see this mystical, misty sight, just at the moment when dawn was slowly breaking. J. M. W. Turner travelled widely to perfect his style of impressionism, the changing light across the landscape. On Skye he explored around Loch Coruisk where he made many sketches and watercolours, some used to illustrate the poetry of Sir Walter Scott. Artists and photographers take note! 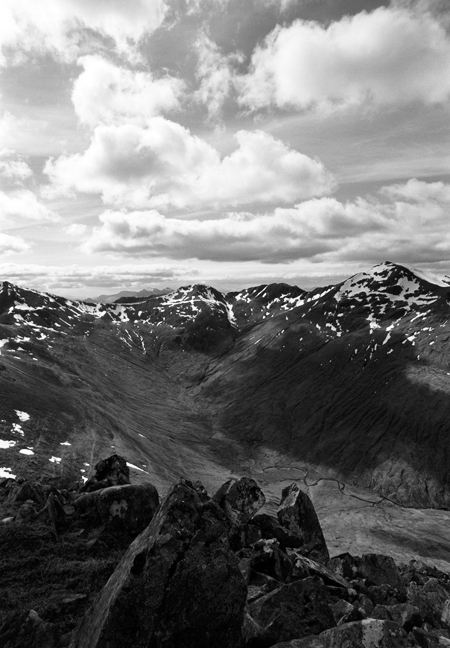 Bleak, desolate mountains and seascapes are beautifully captured in a series of photographs by Hamish King. Observe the high winding road leading to Applecross, Wester Ross – the Gaelic name ‘a Chomraich’, means ‘The Sanctuary’ and it’s certainly a wild and remote peninsula. The memorable drive over the Bealach nam Bo, the only true Alpine pass in Britain, will lead you to the welcoming Applecross Inn. Another image by King shows the shimmering pools of seawater along the beach on the beautiful island of Barra, Outer Hebrides. This is not just a sandy shore but the actual runway for Loganair flights from Glasgow. A unique landing experience, reminiscent of arriving at Denis Island, the Seychelles. Just the climate is different! As you stroll around Gladstone gallery, travelling from tranquil beach to rugged peak, the pure simplicity and subtle beauty of each scene expresses the ancient land lines and poetic sense of place. The majestic, magical, moody landscape of Scotland is here to see in this impressive exhibition. This Land is Our Land, Gladstone Gallery, Gladstone’s Land, 477b Lawnmarket, Edinburgh. 12 – 17 August, 2014. 10.30am-7pm. Free entry. Prints, cards and exhibition catalogue for sale. The Pommery Champagne Café Bar at the Signet Library is back for the Edinburgh Festival with a sparkling, fizzing POP. 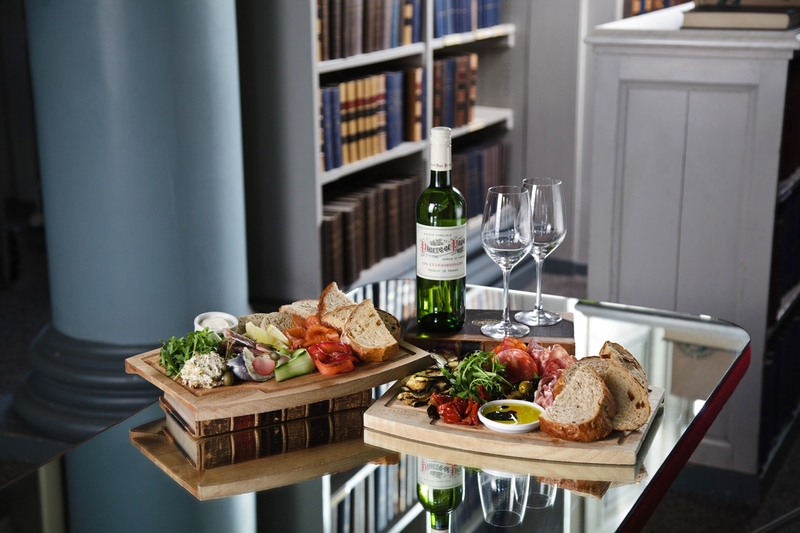 This popular, innovative venture by Heritage Portfolio creates a peaceful sanctuary – away from the buskers and jugglers outside – to enjoy fine food and drink in elegant surroundings. In Parliament Square off the Royal Mile, beside St. Giles Cathedral and the High Court, the Signet Library is a grand Georgian building dating to 1822; during a visit to Edinburgh, King George IV described it as “the finest drawing room in Europe”. The ornate ballroom of a place with its giant pillars, archways, domed ceiling, ornate cornicing, (and shelves of antiquarian legal books), creates a unique historic setting for lunch, afternoon tea, pre-theatre supper, dinner, or indeed share a bottle of Champagne. Tables are well spaced out with ideal seating for either couples, groups of four, or in the centre, high tables for a large party of friends. Also a small Bar area with club armchairs for drinks and nibbles. “Only people with no imagination can’t find a good reason to drink champagne” Oscar Wilde. Jokes aside, these ladies know all about Pommery and describe the extensive choice of champagnes as if masters of wine – the very art of serving and pouring is like a ceremony. As an aperitif before lunch, Ken selects the Pommery Springtime Rose, which is not at all pink, but a soft peachy blush. Made from Chardonnay grapes, it has a subtle, delicate, floral taste, described as “instantly appetising”. I selected the Pommery Prestige Cuvee Louise. Immediately in the tall flute, the fast flowing tiny bubbles reflect the quality and vintage. Exquisitely dry with a lingering after taste. To be sipped slowly. …. 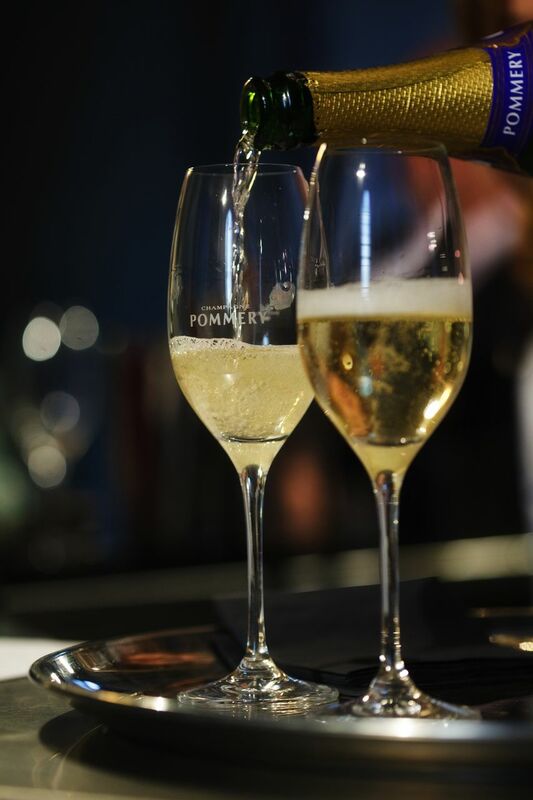 A couple of girls near us have made a wise choice, selecting the Pommery Champagne Tasting – a tray of four different Pommery fizz, to savour and compare, before selecting your favourite, to enjoy a further glass. For our starter, we selected (of course), six Loch Creran oysters to share. Served with lemon, Tabasco and a pipette of a home-made vinegar (Pommery brut, Pickerings gin, herbs and spices), we could each add our own accompaniment to each oyster. Fresh, salty, and oh so sophisticated. 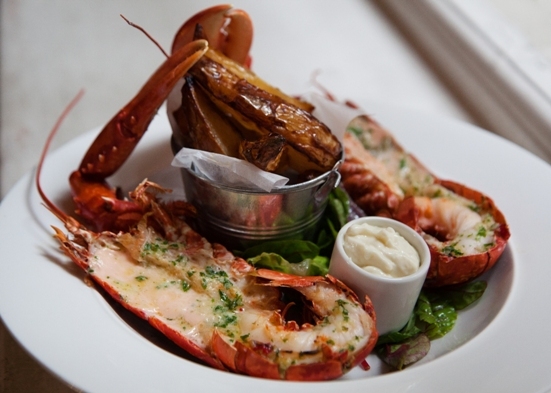 The menu emphasises seasonal Scottish produce – Shetland salmon, lobster, Aberdeen Angus beef burgers, as well as gourmet salads, and sharing plates of charcuterie or grilled vegetables or seafood. I selected the Taste of Smoked Salmon platter – speciality beetroot cured and oak smoked fish, bursting with flavour. Over the table, Ken had a huge bowl of Crevette prawns, roasted in a spicy, chilli sauce, with a rocket salad. Cooked in their shells, it was slightly messy to eat, but assisted with several napkins and licking of fingers. We also shared a small bucket of fat potato wedges (naughty but nice), and to drink, a glass of dry Languedoc Colombard Blanc wine. Sharing plates offer a summer picnic style meal, perfect with a glass or two of Pommery. To finish an espresso coffee – although we could have sampled a Belgian chocolate brownie or strawberries and cream or other tempting dessert. By now, mid afternoon, several tables were filling up with several ladies, friends and families to indulge in a sumptuous Afternoon Tea. Such a traditional, and fashionable treat. with of course, a glass of bubbly. For a special occasion, birthday or Festival get together, the VIP Cuvee Louise Lounge can be booked for a private party for up to 15 guests. If this were a Fringe show, the Pommery Café Bar would get 5 stars for glamorous style, graceful direction and fizzing fun. Performances daily, 1 – 25 August. 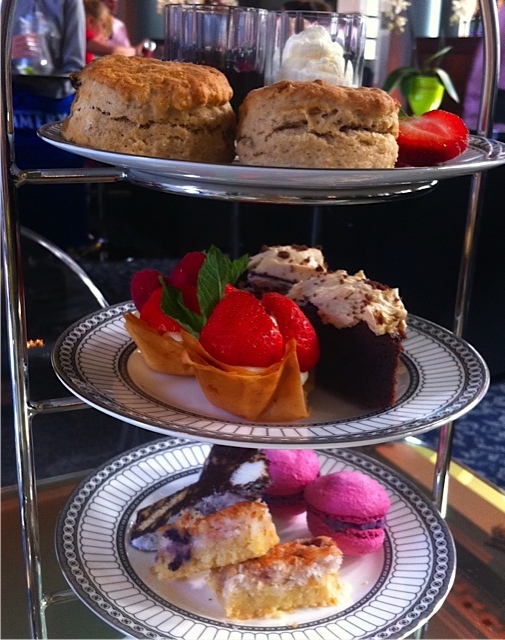 The Pommery Cafe bar opens at midday and lunch is served from 12-4 pm, Afternoon tea from 12-6 pm and hot food until 10pm, with drinks and snacks till late. There’s also a shop selling a wide range of Champagnes, from mini Pop bottles (200ml) to Grand Cru vintage, gifts and souvenirs. 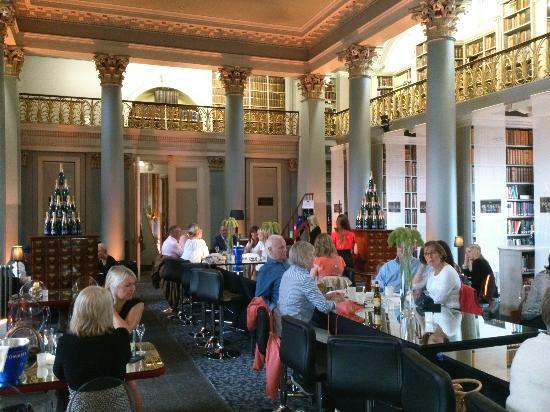 As part of the Edinburgh Festival Fringe, an appestising series of Food and Drink Events presented by professional experts will take place in the Upper Signet Library. Sara Hicks, the UK Ambassador for Pommery Champagne will be giving tutored tastings. 13, 14, 15 August, @ 5.30 and 7pm. 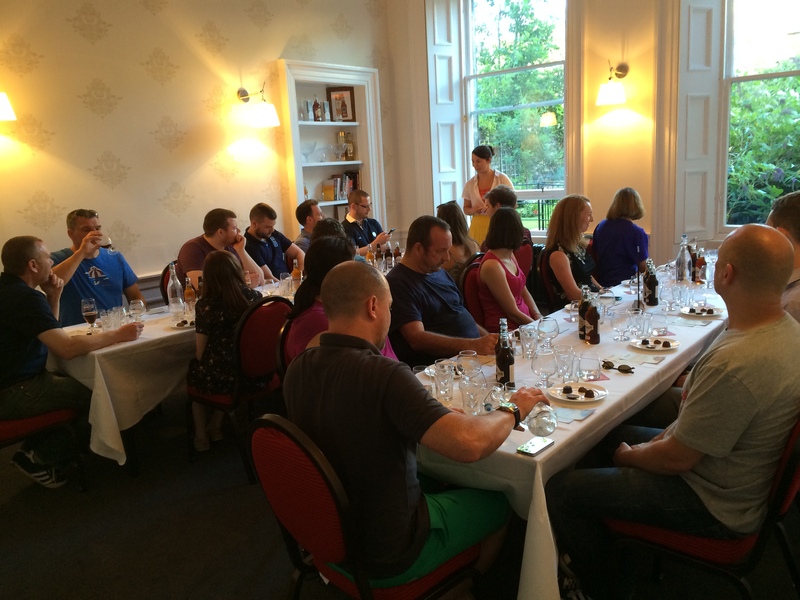 “Chocolate, Whisky and Cocktails” with The Whisky Belle – Amanda Meikle’s masterclass. 3, 10, 17, 24 August @ 2pm. “Single Malt Sundays” with The Whisky Belle – single Malts and Tapas. 3, 10, 17, 24 August @ 5pm. Exclusive Dinner and Tattoo package: 3 course meal with a Pommery cocktail and ticket to the Tattoo on selected dates, Thursday – Saturday. The Edinburgh Festivall Fringe is just as much about a summer party atmosphere, drinking and socialising with friends, as experiencing a rich cultural feast of arts, comedy, theatre and music. 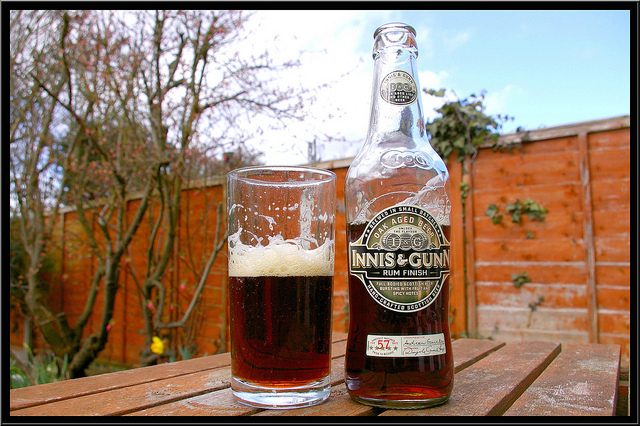 Innis & Gunn, the independent master brewers of Scottish craft ales has built up an enthusiastic fan base over the past decade. Spring 2014 saw the opening of their new HQ in a grand townhouse at 6 Randolph Crescent, West End, Edinburgh. This venue is used for private and corporate parties, tutored food and drink tastings and hospitality events. A few months ago, I was invited to experience a media launch at the HQ where we heard the fascinating story of how Innis & Gunn was founded in 2003 (named after the middle names of Dougal and Neil Sharp). Specialising in oak aged, craft brews, I&G has won many awards, is the top ale brand in Sweden and the best-selling British bottled beer in Canada. I am not a regular beer drinking, but my goodness did I enjoy learning how to nose, pour and finally taste a selection of ales, starting with the Original Oak Aged beer. ” Aromas of vanilla, hints of citrus, with a malty, lightly oaked, soothing and warming in the finish.” says one review, but this sums it up in a nutshell, ” Absolutely the best beer I’ve ever tasted. It’s like a slice of heaven poured into a bottle.! Try it and see for yourself…. I did enjoy tasting the distinctively smooth Rum Finish, ( which I describe as like a classy Caribbean rum punch in a bottle), and the new Scotch Malt Whisky Trail with its rich, mellow, smoky flavour. Tickets, £15 (plus booking fee). 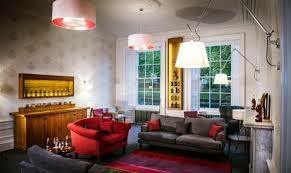 Guests are offered a beer on arrival in the Drawing room, to entice mixing and mingling and a party atmosphere. 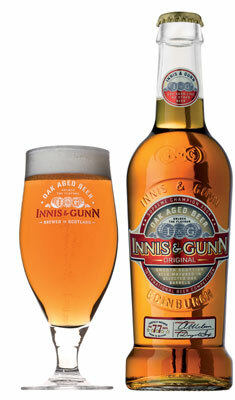 Then join in an informative but fun tutored tasting session with four different Innis & Gunn beers. Test your beer knowledge with a quiz and if you wish, and after the official part of the evening, continue dowstairs in the Beer Kitchen (pay bar), to sample a few more ales, perhaps some rare bottlings. The chance too to ask the expert bar tender everything you wanted to know about beer but were afraid to ask. (This Beer Tasting session also runs from 2pm – 5pm, on Saturday 30th August). A Night of Scottish Bites and Beers take place on 6th, 7th, 20th and 21st August, 6pm- 8.30pm , Tickets, £ 25 (plus booking fee). 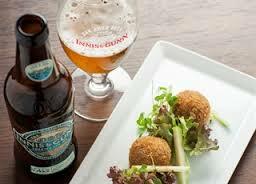 A welcome drink in the Drawing Room followed by a beer tasting with four beers complemented by four Bites – a selection of quality Scottish food: Quails egg haggis Scotch eggs, Innis & Gunn pork sausage with beery mustard mash, Hot smoked salmon with oatcakes, Cheese board from IJ Mellis. The I&G Beer and Cheese pairings is a fantastic foodie experience. I’ve sampled for instance, I& G Original with a chunky slab of Isle of Mull Cheddar, Smokin’ Gunn with a salty slice of Pecorino Aragonese and my favourite Rum Finish complements the tangy Strathdon Blue cheese. After the Bites and Beer session, you may end the evening in the Beer Kitchen for a final pint or two of your favourite ale in typical Festival party manner. These Festival Fringe events at Innis & Gunn HQ sound like a great night out.